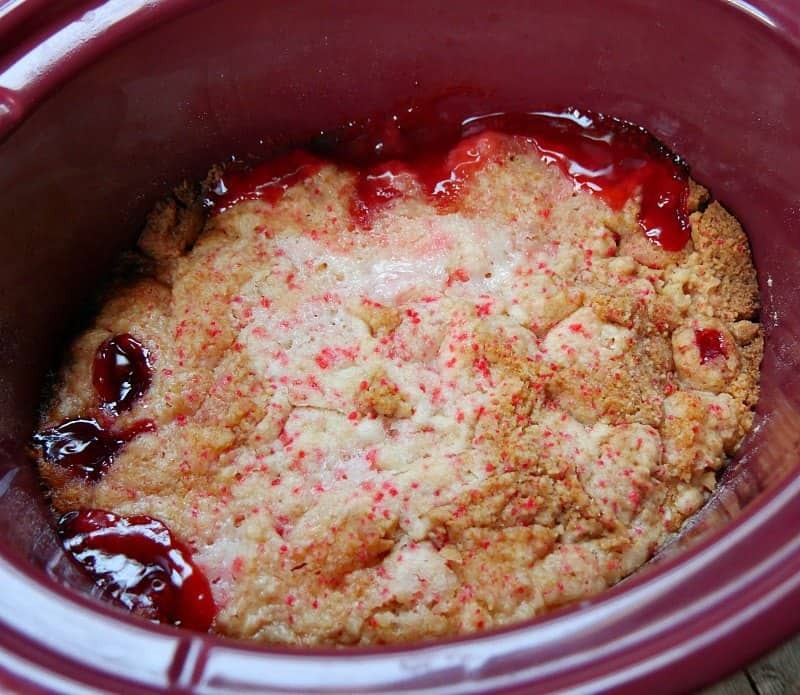 A few years ago I tried this easy 3 ingredient Crock Pot Peach cobbler recipe. I didn't believe it would work, but much to my surprise not only did it work, but the cobbler was really good. So of course, I had to try a few other variations because it's just so easy and so good. 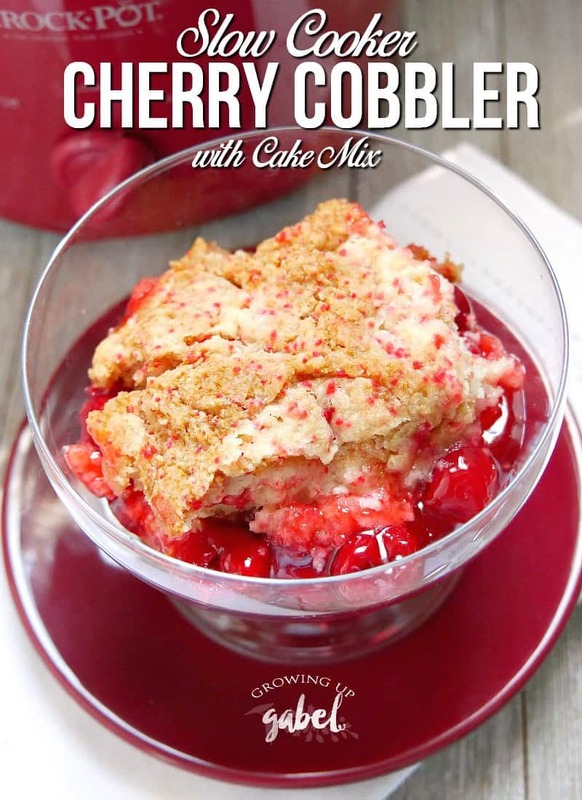 First up, a cherry cobbler made with the same basic three ingredients. Rather than canned fruit, though, you will use canned pie filling. I'm pretty certain you could also use a homemade filling, if you want as well. Just like the slow cooker peach cobbler, this fruit cobbler uses canned fruit, a cake mix and butter. 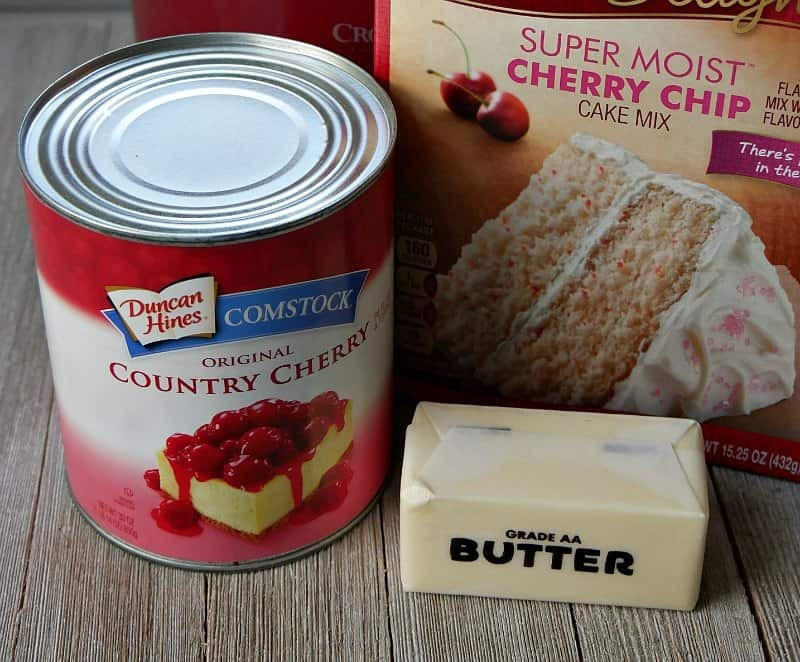 We paired the cherry pie filling with cherry chip cake mix. I was afraid it'd be too much cherry but it was perfect. 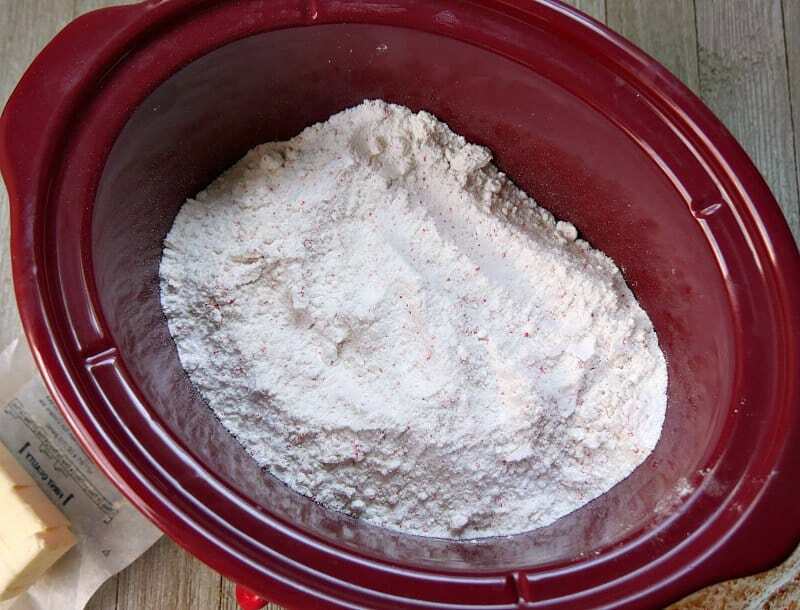 You could also use a white or yellow cake mix. Or go for a chocolate cherry cobbler with a chocolate cake mix. Have fun with it! 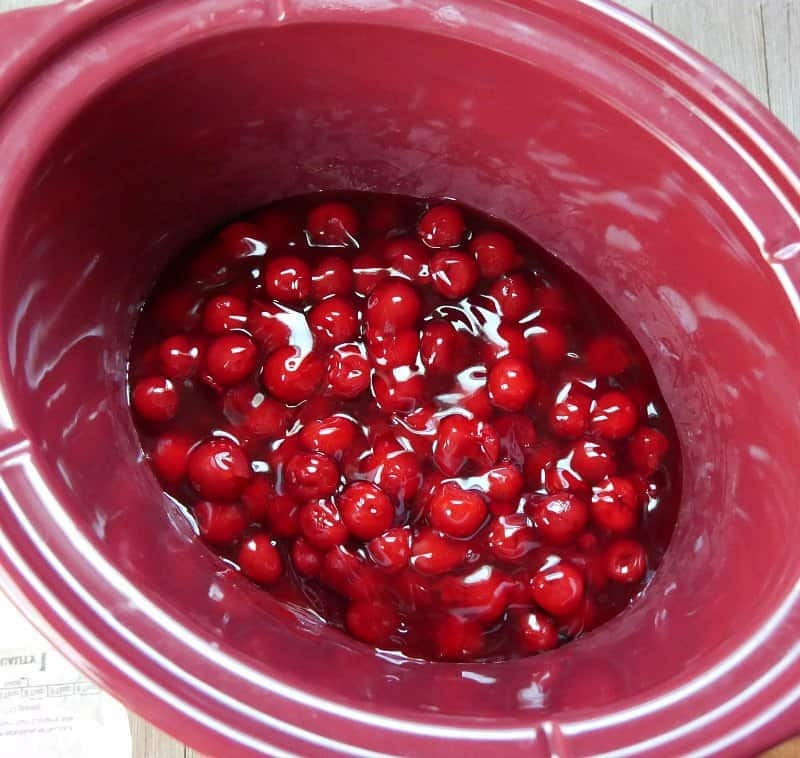 Dump the pie filling in the bottom of a 4 quart slow cooker. I like the oval slow cooker for this recipe because it allows the cake to spread out and not be quite as thick of a topping. We used a 30 oz can of cherry pie filling but you could easily use 2 cans or one 30 oz and one 15 oz can. Dump the cake mix evenly on top of the pie mix. Try to get the mix evenly spread so it bakes up at the same thickness. Cut a stick of butter in to pieces. Scatter the pieces evenly on top of the cake mix. That's it. DO NOT MIX. Resist the urge! Just put the top on, set the slow cooker to high and walk away. Start checking the cobbler at 2 hours to see if it's done cooking. Slow cookers are all a little different. 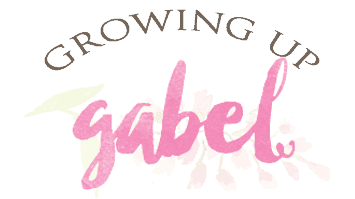 The cobblers take 2.5 – 3 hours in this slow cooker. You want the fruit to be bubbling and the cake mix to be fairly browned on top. Use a toothpick to check the cake for doneness. Let the cobbler cool so it's not boiling hot before serving. It's great warm or cooled. 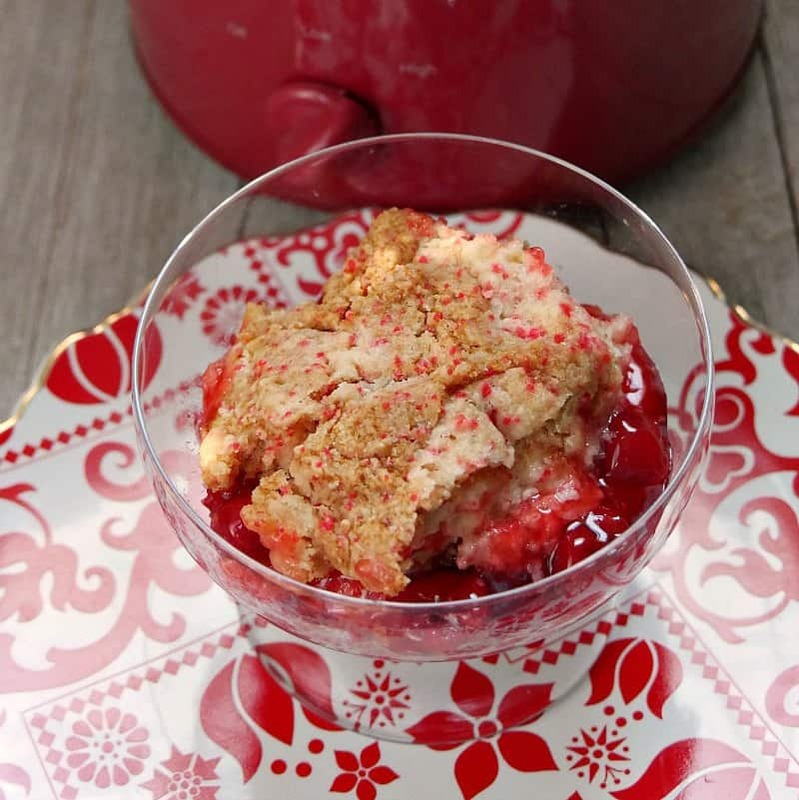 Serve with whipped cream or a big scoop of vanilla ice cream. Empty the pie filling in to the crock of a 4 quart slow cooker. Dump the cake mix on top of the pie filling. 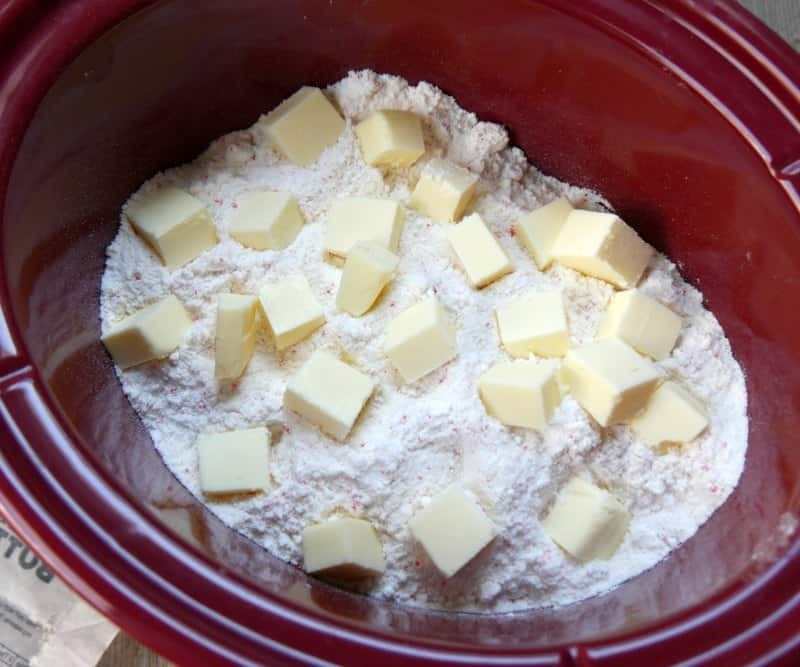 Scatter the butter pieces evenly on top of the cake mix. Put the cover on the slow cooker and turn on high. Cook for 2 hours. The cobbler made need to cook up to 3 hours total. Is this something you can bake in the oven as well? I’ve never baked this in the oven. can you cook it on low? I am making 12 servings does that add to the cook time? Sure! It will just take longer. I’d probably double the time but I’ve never tried it. This looks delicious. I’m going to Pin this post to my dessert board. I’ll be making this for sure. Thanks for sharing. Yes, in fact I am working on a post about an apple cobbler version! 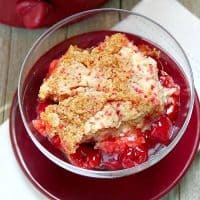 I’ve never been much for desserts in the slow cooker, but this is the exception. 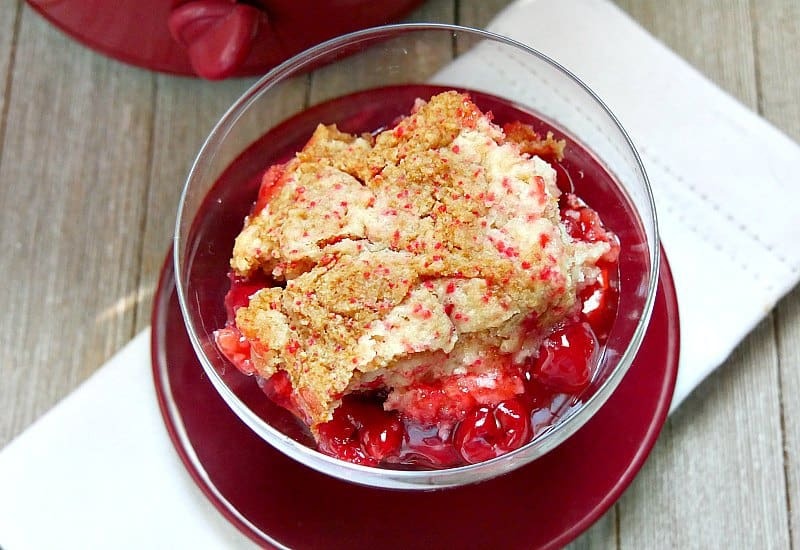 I adore anything cherry and 3 ingredients tops it off perfectly! Thanks for sharing. I hope you can bring this over to What’d You Do This Weekend. Party starts Monday. 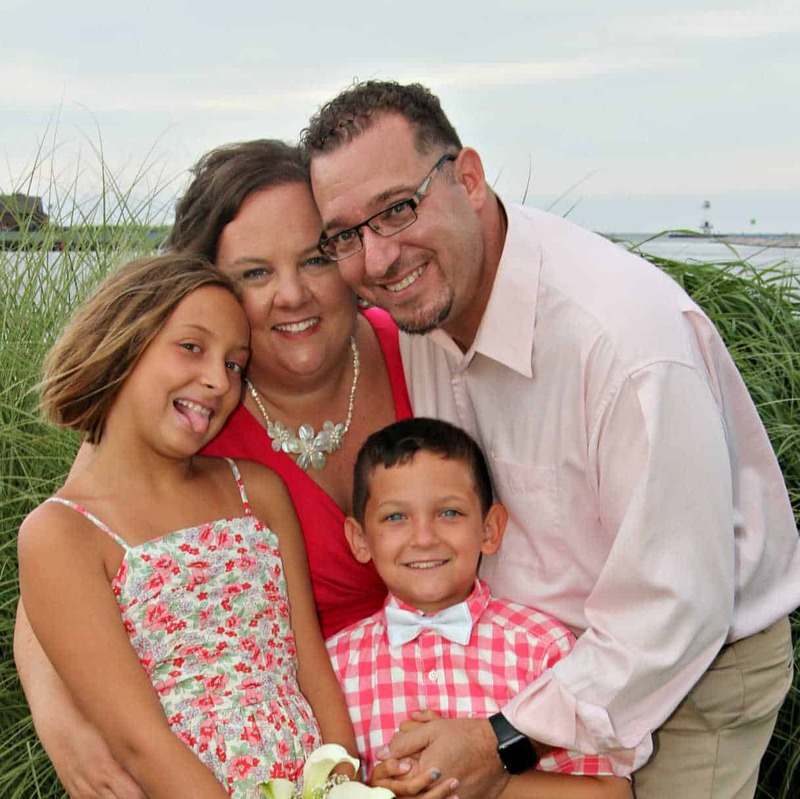 Can you use a 6 qrt slow cooker too? This looks so easy. Can I use a round crock top? Yes! Just know that the cake on top will be a thicker layer. You can but the cobbler will be thinner. This dessert looks incredible !! And by reading your recipe it looks easy to made. Oh my that looks so good! Had to pin this one!